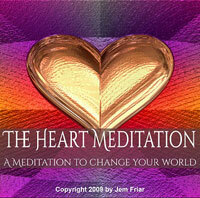 A meditation to change your world. This simple but powerful meditation will enable you to deeply connect with the Love & Compassion that exists inside yourself for the purpose of deep healing . In our essence we are joyful, loving, self-sufficient, compassionate beings yet growing up in the modern world we forget and get disconnected from this knowing. Many of us mostly only connect with our hearts & the feelings of love in relationship with our families, partners, close friends or pets yet our capacity to channel, feel & express love is far greater than that. Regularly practicing this meditation can allow you to heal many old emotional wounds and past relationships, as well as to change the way that you are relating to yourself and other people on a daily basis.